Halve, pit, and finely dice avocado. Peel mango, remove core, and dice. Peel and finely dice red onion. Wash, then dry and chop cilantro. Halve grapefruit and slice along sides of membranes to separate segments. Collect some of the grapefruit juice and set aside. Add diced avocado, mango, red onion, cilantro, grapefruit, salt, sunflower oil, grapefruit juice to taste, and chili flakes to a bowl and stir to combine. Set salsa aside. Zest and juice lime. For the dip, add crème fraîche, lime zest, and lime juice to a second bowl and stir to combine. Season with salt and pepper to taste. Set aside. Cut fish fillet into approx. 5-cm/2-in. thick chunks. Add flour, cayenne pepper, ground ginger and coriander to a small bowl and stir to combine. Add cut fish filets one by one and toss to coat. Heat oil in a frying pan over medium heat and fry coated fish filets from all sides for approx. 2 – 3 min. until crispy. Remove from pan and let drain on a paper-towel lined plate. Heat a dry frying pan over medium heat and toast each tortilla on both sides for approx. 20 – 30 sec. For serving, spread some crème fraîche mixture on a corn tortilla. 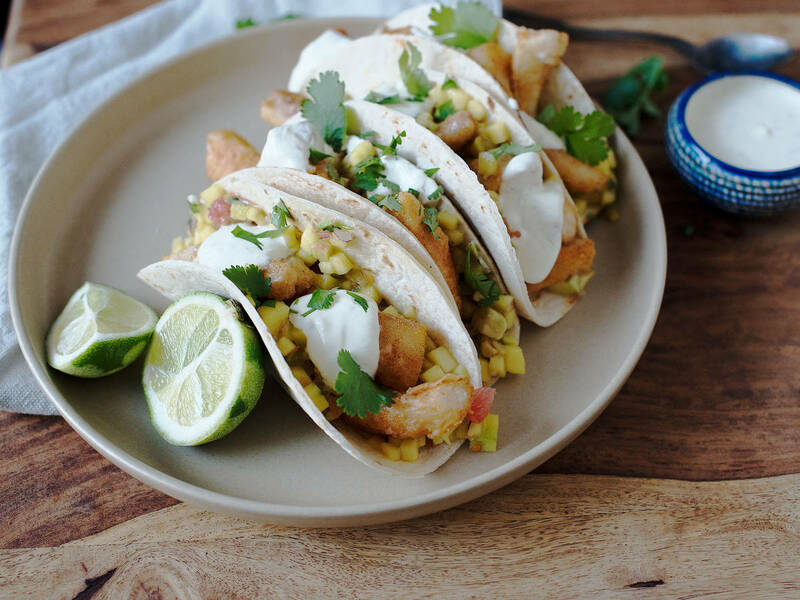 Place some fried fish fillets on each tortilla and top with grapefruit salsa. Serve with lime wedges, if desired.